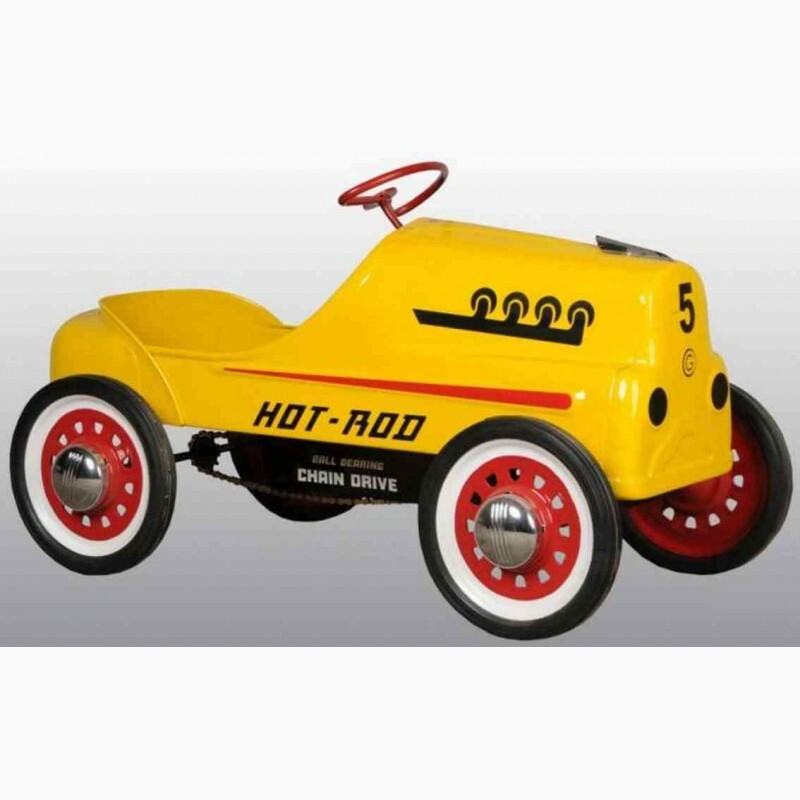 If you have a pedal car that you want to restore and you need parts for it, you must first determine what kind of car you have so we can supply you with the correct parts. The following illustrations show many of the more popular and prevalent cars. Take a moment to see if yours looks like any of them. 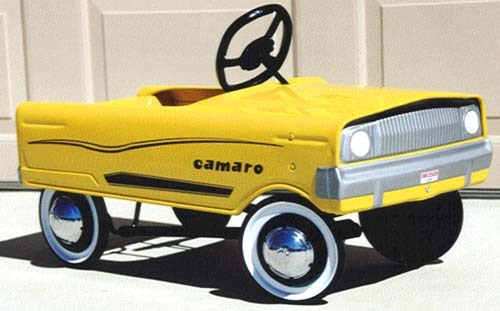 Be aware that almost all pedal car body styles (including the ones below) were made in a number of variations. By adding ladder racks and painting it red, it became a fire truck; a color or decal change made for even more variations. The parts though, for the most part stayed the same regardless of what model it was made to resemble. 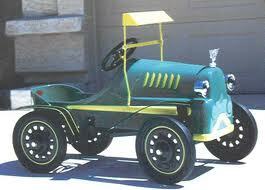 We currently stock most parts for these and other pedal cars. Just click on your car and we'll take you to your parts. If we dont have the part you need, we may be able to find it for you. To place an order, please call 248-853-0215. 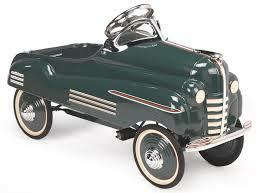 This pedal car was first made by the Steelcraft Co. in 1940. 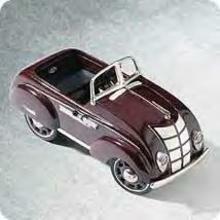 The original body color was maroon with silver trim, bumper, and windshield. 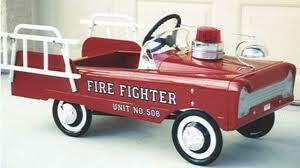 This is an example of the "Fire Chief" version. The 48 Pontiac was produced until 1950 when the Champion was first introduced. 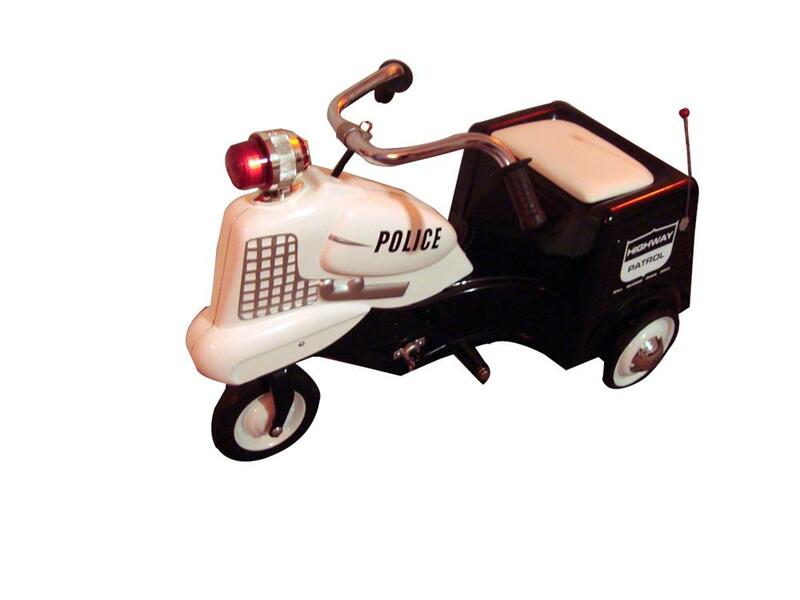 This pedal car was made into a number of variations including station wagon, fire truck ,and a fire chiefs car. This car was introduced in 1951 in three models, dump truck fire truck, and station wagon. 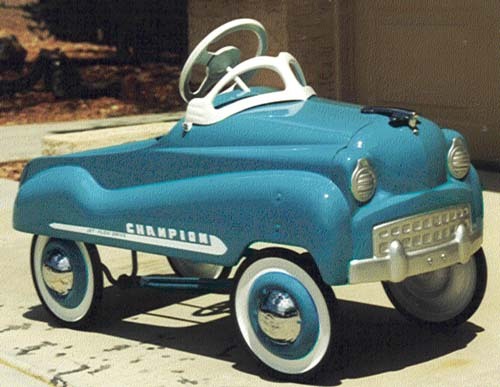 This best selling pedal car was introduced in 1951. Commonly known as the "Dip side" Champion. 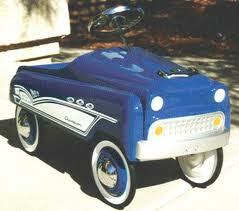 There were a very large number of variations to this particular pedal car. 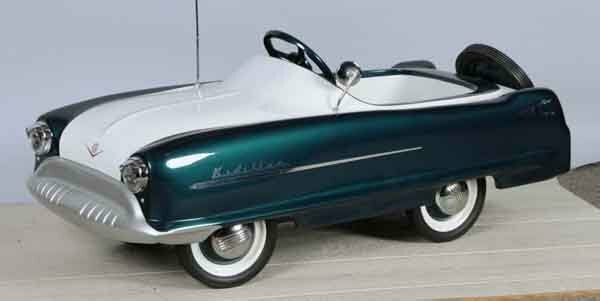 Very similar to the pedal car directly above, this champion has a different windshield, grille, hood ornament, and fender shape. 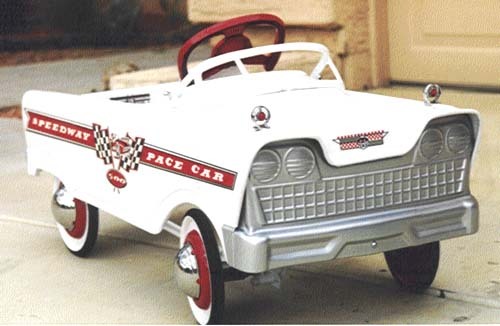 One of the more rare, valuable, and collectable pedal cars. The car came in four variations, and the "Imperial" model had working headlights. We manufacture every part of this pedal plane. We can supply kits, individual parts, or finished planes. 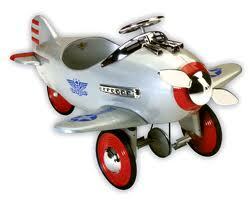 This plane was designed by Viktor Schreckengost, and recently remarked that it was his favorite pedacar design. 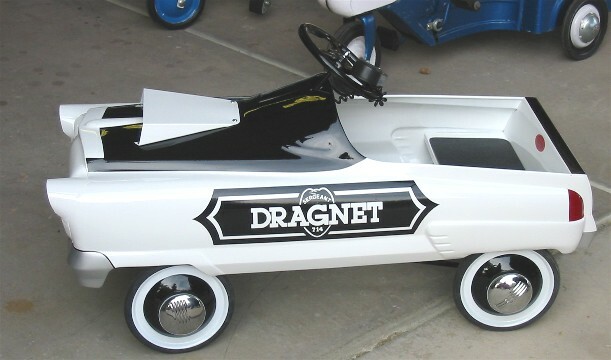 From 1968 to 1974 this pedal car could be found in many garages. The look of the car was updated to be more appealing. Considered to be one of the more graceful and attractive designs, it is very desirable and collectable today. 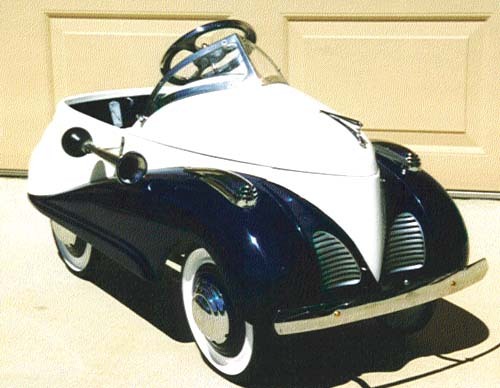 One of the most desirable of the post-war cars, this car came in three trim levels. The "comet" had painted-on bumpers, the "torpedo" had separate chrome-plated bumpers, and the "road-master or Buick" added four port-holes. 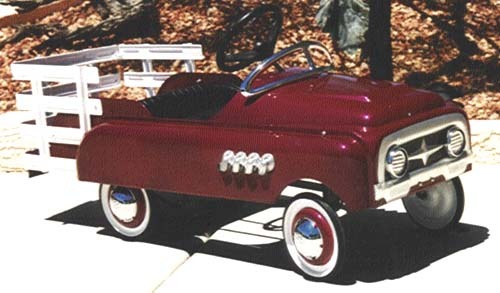 First produced in 1960, this pedal car was made in several variations until 1967. The "Tee Bird" variation was one of the more popular variations. 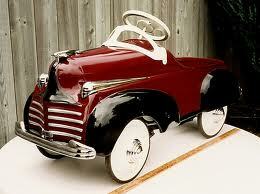 This pedal car was intended to look more modern than the cars from the 40s. 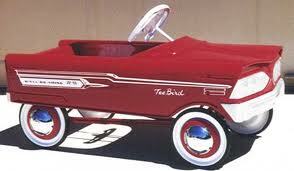 To many pedal car fans this car reminds them of the 59 Ford. It was made in many variations. Made for more than ten years, and was very popular, and a consistent seller in numerous variations. 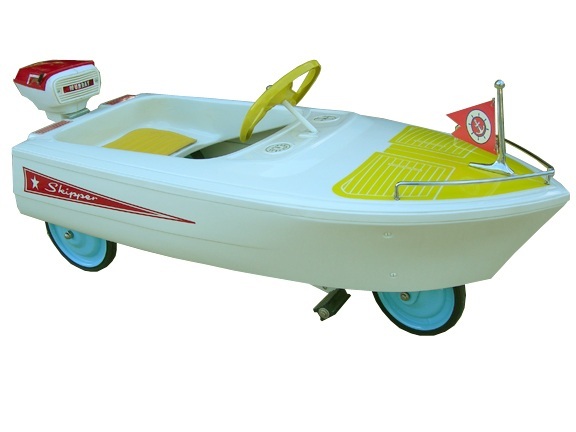 This non-floating boat went under the names "Dolphin," "Skipper," and "Jolly Roger." One of the most unique pedal vehicles. First introduced in 1955, this vehicle had three variations, the "Good Humor," the "Radar Patrol," and "Airport Jet service." 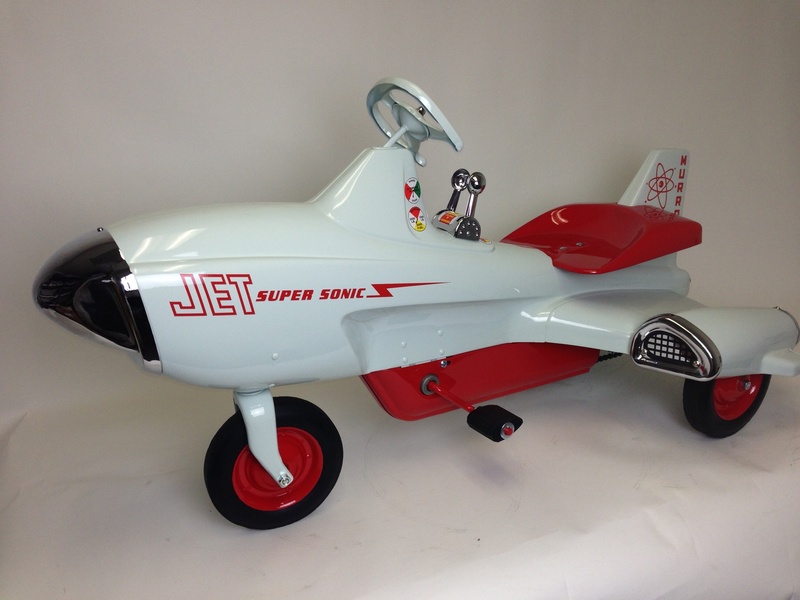 This three wheeled jet was available in three variations, the "Atomic Missile," the "Supersonic Jet," and the "Sky Rocket." Chromed dress-up parts are available for this pedal vehicle. 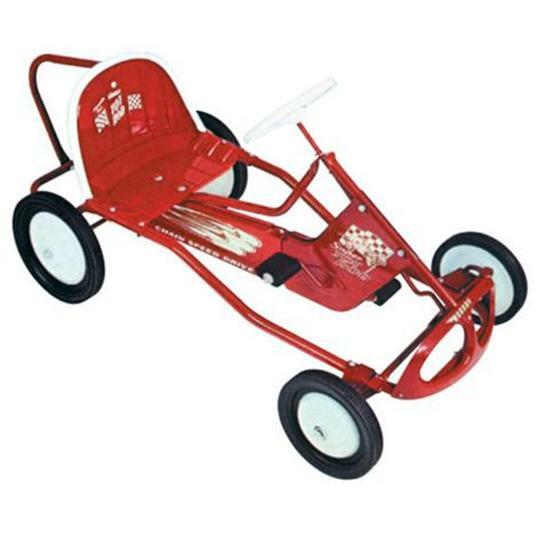 Made in both pedal-drive, and chain-drive, this go-kart looking pedal car quite popular. 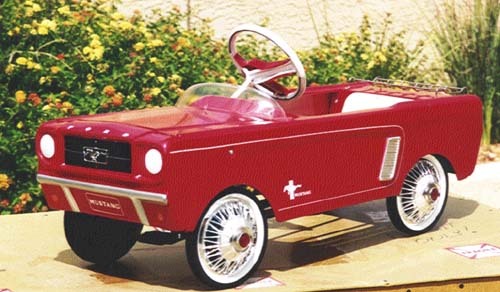 There are probably more of these pedal cars in existence than any other. 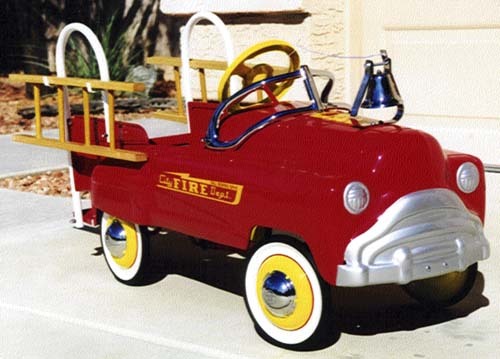 This car was one of the last metal pedal cars in production, and was made in the following models: "503 Fire Chief," "505 Fire Fighter," "Jet Sweep," Tote-All," 508 Fire Truck," and "519 Fire Truck." Built for Ford to promote their new pony car, the Mustang was produced until 1972. Today it is a very desirable collectable. The Mark V was introduced in 1965, and came in five variations. 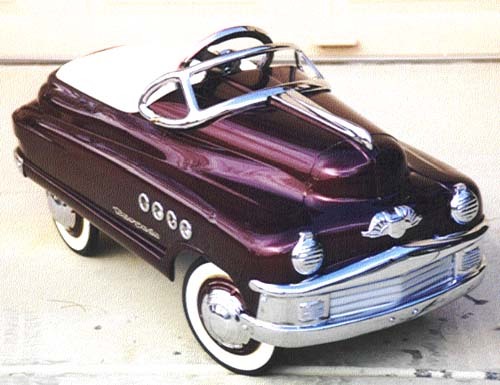 A very classy styled pedal car, the deluxe version had functional headlights. One of the largest selling AMF cars, this particular car was produced until 1980. Made in several variations. By starting with the body of the "Hot-Rod," and adding fenders and a windshield, Garton was able to create the feeling of a Model T. By adding a cow-catcher, and replacing the windshield with a locomotive cab, the "Casey Jones" was born.